Years ago when my son was in Boy Scouts, I was tasked with presenting a talk on hiking. As I pondered hiking, it seemed that everything boiled down to one key skill  being observant. A good hiker is an observant hiker. He or she is aware and alert and takes care to observe, always. And as I contemplated what a hiker should be observant for, it fell into four areas. A good hiker should be observant for safely, navigation, knowledge, and appreciation. And those four items conveniently spell out the acronym SNAK. Read full article. Helping childern gain a love and appreciation for nature and the great outdoors is a wonderful gift to them. Read my blog post for some helpful tips. There are several good guide books for hiking in Southern California. Read my book reviews here. Outdoor experts agree that there are essential items that must to carried along on outdoor adventures. These have been dubbed the "Ten Essentials." According to GORP hiking expert, Karen Berger, the "10 essentials" were originally listed in the 1930s by the Mountaineers, a Seattle-based hiking, climbing, and conservation organization. Now "Ten Essentials" lists are published in numerous places. And all the lists I've seen include virtually all the same items. That's good, because everybody agrees on the essentials. However, I have not found many "experts" who are willing to admit that the number is not 10; it's more like 13! My guess is that the original list had 10 items, but over time other items were added, but no one wanted to increase the number, so items were grouped together to keep the list at 10. For example, the 10 essentials published by the Boy Scouts of America combines matches and fire starters as a single item, as well as and map and compass. The Sierra Club lists those items as separate, but groups together extra food and water. Karen Berger lists extra clothing and rain gear as one item, while the Scouts list them separately. And so on. GORP Hiking Skills - The Ten Essentials by Karen Berger. A list of the "10" with a short description of each. Ten Essentials for Hikers by John McKinney. A good treatment of the "10" essentials and helpful advice about gear. The Ten Essentials from survival-center.com by Scott Stoddard. Good explanation of each. The Ten Essentials: Updated Ten Essential "Systems" - From REI. Good description of each, tied to products. The Ten Essentials + Four - backpacking.net. Good list with helpful descriptions for each. LocalHikes Gear Favorites - by Jim Zuber. Excellent list and description of clothing and equipment for the serious hiker. Just to reiterate, all the lists that I have seen have all of these items, it just that they group some of the items to keep the list at ten. So no matter how you want to count them, you are gambling with your heath and safety, and maybe even your life, if you neglect to carry these items when heading off into the wild outdoors. There are several other items that I'm surprised that are not on the list, but which I would deem essential or, at least, standard equipment which I carry on every hike. Whistle. This item is often mentioned in the literature, and I think that most everyone would agree that it is an essential item. It's just that no one seems willing to make it number 11 in the essentials. But in my book, a whistle is indeed essential. I think of the hiker who fell into a craves in Joshua Tree, and it took rescuers five days to find him. He had no whistle and no way of signaling his location! This point also underscores that even a short one-mile nature walk can turn out disastrous. Remember, three shorts blasts on the whistle is the universal signal for help. Tissue. I suppose one could use a shirt sleeve, bandana, or a fig leaf, but I'd much rather use a tissue if I've got to wipe my nose or bottom. Some people may simply include tissue as part of the first aid kit, but I prefer to have it on the list, particularly since it's something I use often, and in non-emergency situations. I keep my tissue in a plastic baggy, and I carry an extra baggy for the used tissue. Watch. A timepiece, to me, is an essential navigation aid. I never hit the trail without it. In fact, I use it more than most items on the list of essentials, including my compass. Pencil and paper. I've seen this listed as part of the first aid kit, but I'd prefer to see it stand alone. I keep a hike log on every hike. Additionally, paper could be used to write a note in an emergency. I always carry a spare pencil. Bandana. Maybe this is not considered an essential, or perhaps it's included in a first aid kit. But for me, I never hike without it. In fact, I carry two, a clean one in my first aid kit for emergencies, and one in my pocket for wiping my sweaty brow. Consider some of its uses: head band, handkerchief, water filter, sling, bandage, dust mask, flag, washcloth, towel, hot pad, etc. Wet wipes. These are marvelous inventions which I list as must-carry equipment. I have some pre-wrapped towellets which are included in my first-aid kit, but I don't really use these. They end up getting tossed out and replaced with the regular rotation of first aid supplies. But I do use regular wet wipes a lot. Since we use them in our household, I put a few in a baggy and carry them in an outer pocket of my daypack. They come in handy for such things as washing my hands or face, cleaning up a skinned knee, or whipping off a piece of equipment. I put the used ones in the same baggy as used tissue. Powder. My feet love to be powdered. I pack a little travel-size container and refresh my feet on a long hike. It rides in a baggy, just in case the container comes open. Insect repellent. In some areas in some seasons, bugs can be a nightmare. A repellent with deet works the best. Plastic garage bag. A small white kitchen trash bag can be a very handy item for such things as carrying wet clothing, protection from rain, catching rain, making a ground cover, or for cleaning up litter from the trail. Space blanket. I'll toss this inexpensive foil sheet into my pack if I'm going on a hike into higher elevations or deep into the back country. Its few ounces of weight are nothing compared to its benefit in an emergency. Camera. I love to have a photo record of my outings. Binoculars. Great for looking at landmarks from a mountain peak, viewing animals, or scoping out a route. Magnifying glasses. I started carrying a pair in the past few years as my middle-aged eyes where not as good at reading the fine print on a map. But they also proved useful in getting a close-up view in removing a splinter or studying a flower or bug. Trail guides. I usually make a copy of the trail description from the book I'm using  much lighter than carrying the book. I also sometimes carry nature study materials  field guides or plant lists, etc. Cell phone. Often I don't get reception on a hike, but sometimes I do. Nice to have along just in case. Two-way radios. I carry these sometimes, particularly if I'm with a group. Gloves. If I suspect that the weather may be cold, I'll add some knit gloves to the pack. If I anticipate bushwhacking or rock climbing, I'll carry a pair of leather work gloves. Prunners. Garden clippers have become a standard part of my hiking equipment. I carry them along if I'm going to be hiking an unfamiliar trail which may not get regular maintenance, or if I am exploring or anticipate forging through brush. Leather work gloves are a nice partner for the clippers. GPS device. These high-tech navigational aids can greatly enhance the accuracy of knowing where you are, and they can be a lot of fun, too. But for me, I still find a map and compass do just fine, particularly if I am hiking established trails. Altimeter. This tool is also helpful for navigation in telling your elevation. Pedometer. I've never been confident enough with their reliability to invest in one. I still rely eiather on my map and watch to help me gauge the mileage, or a GPS. Thermometer. I'm often curious of just how hot or cold it is. A thermometer can provide useful data to add to your learnings. Trekking poles / Walking stick. Many hikers and experts extol the benefits of using hiking poles in your hands to aid in balance and traction as you hike. Others prefer a walking stick. Personally, I don't like either. I like my hands free. Sometimes I carry my trusty ol' ski pole if I am going to be climbing a steep grade, doing a lot of stream crossings, or blazing off trail through brush or grass. I also use it when I'm hiking at night. Fanny pack. I have a little fanny pack which is my hiking kit. It includes many of my essentials: compass, pocket knife, water proof matches (regular stick matches wrapped in plastic and carried in a 35mm film container), fire starter (candle), flash light, extra bulb, sun screen, lip block (extra one), bandana, emergency poncho, whistle, water purification tablets, repellent, extra pencil, coins, hand sanitizer, and my first aid kit, which includes, among the standard supplies, Benadryl stick (for bug bits), ace bandage, and Q-tips. I pack everything in separate baggies, which keeps it all dry and clean, and protects against leaks (it's a real bummer, for example, if the sun screen gets all over the everything). I check the batteries in the flashlight before a hike. I always have one battery in the flashlight flipped around in the backwards position, preventing it from turning on accidentally and using up the batteries. I always keep my fanny pack packed and ready to go. It makes it real easy to grab it whether I'm going on a long hike or a short stroll. 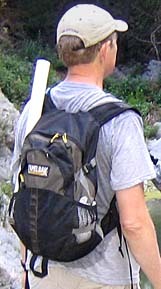 Daypack. I use a Camelbak Trail Blazer. I love it. It has a two-liter hydration system, which sure beats the canteen I used to carry. Extra water (besides the two liters in the hydration systems, I carry one or two half-liter bottles of water. fanny pack with binoculars case fastened to the strap, and sometimes the camera. In recent years, however, I've been putting the fanny pack in my pack. This page was last updated October 14, 2012.